He can veto the state budget and call special sessions if the Legislature doesn’t advance his three constitutional amendments and crime bills. Dunleavy said the amendments he introduced would allow public votes on changes to taxes or permanent fund dividends. And he said the crime problem requires more action. 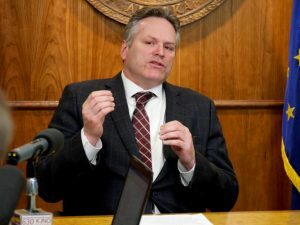 “If we’re not going to have any discussions on constitutional amendments allowing the people of Alaska to vote, and if we’re really not going to have a serious discussion on the crime issue, it makes it real tough to come up with a deal” on the budget, Dunleavy said. Dunleavy said that the House of Representatives hasn’t cut spending enough in the budget proposal it’s debating. “If all we’re going to have in the budget are … small reductions, then we really haven’t accomplished much this year,” he said. Dunleavy didn’t rule out using his authority to issue line-item vetoes and to call the Legislature into special sessions to pressure lawmakers to pass more of his agenda. Dunleavy said that Alaskans are entitled to a full dividend under a 1982 state law. That would equal roughly $3,000. The governor also said he has the ability to veto public school funding. That position differs from that of nonpartisan lawyers for the Legislature. They’ve said that unless the Legislature makes changes, a law passed last year establishes how much the state must fund schools next year. Anchorage Republican Senate President Cathy Giessel said crime has been the top priority of the Senate majority since before the session began. She expects the governor’s crime bill package to advance in the Senate. Dillingham independent House Speaker Bryce Edgmon said legislative leaders are focused on what it will take to end the session. Edgmon said lawmakers will talk with Dunleavy and his staff as soon as Wednesday about what it will take to agree on a budget.